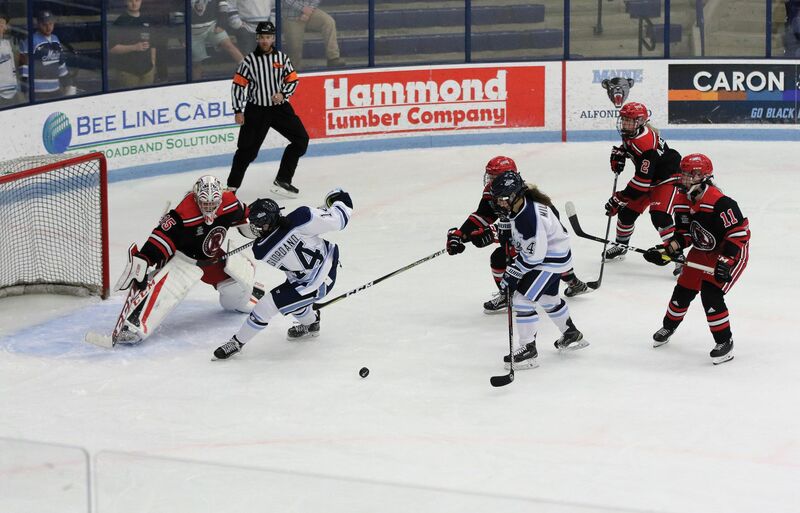 In an exciting exhibition match against the University of New Brunswick, the University of Maine Women’s ice hockey team came away confidently with a 7-0 win. The Black Bears started shooting within the first few seconds of the game. After a faceoff won by the Black Bears, Martens made three straight saves, followed by a shot by first-year Ida Press that sailed into the net, putting the Black Bears on the board and making the score 1-0. Press was assisted by first-year players Celine Tedenby and Ali Beltz. In regular fashion for a typically passionate crowd, the Black Bear student section cheered. Following the goal, shots by second-year Taylor Leech and third-year Jessica Jacques were both saved by Martens, leading to faceoffs in UNB’s zone. Shortly after a turnover subsequent to a Black Bear-won faceoff, Varsity Reds Jenna Maclean and Tamina Kehler took shots at the Black Bears’ goal and failed to score. After several saves by Martens, there was a power play, and senior Alyson Matteau scored the second goal to put the Black Bears up 2-0. After a thrilling series of faceoffs and blocked shots by both teams, first-year Liga Miljone scored the next goal for the Black Bears in their rapid-fire lead of the first period with an assist by second-year Anna Zikova. The rest of the first period was a strong clash between teams, but the Black Bears prevailed after many shots by both sides. Despite valiant efforts by UNB players Martens and Sydney Desrochers, UMaine assistant captain and fourth-year Cailey Hutchison hammered her way to a fourth goal with an assist from third-year Jessica Jacques, putting the Black Bears up 4-0 at the end of the first period. In the second period, UNB came out fighting, standing as a firm wall against UMaine, with Varsity Reds goalie Kendra Woodland saving several constant shots. Other shots flew overhead or flew wide, but in the end the Black Bears’ overpowering offensive efforts paid off with Tedenby scoring a goal, with the puck sliding right between Woodland’s legs and into the net. That was the only score of the second period, putting the game at 5-0 before a stalemate ensued for the rest of the period. The third period saw the Varsity Reds fighting hard to bring themselves back into the game, but the Black Bears’ offensive dominance was constantly deep in UNB territory. Rapid fire shots and a sturdy defense constantly stealing the puck as it strayed back to the Black Bear’s territory stifled any efforts from UNB. The Varsity Reds also proved agile adversaries, pushing their way on a few offensive series that caught the Black Bears off guard. However, they failed to score. Meanwhile, the Black Bears pushed through their way through UNB’s defense on two more occasions. The sixth goal for UMaine was scored by first-year Ally Johnson after three missed shots and a block. Tedenby struck again with the seventh and final shot with an assist by Beltz, bringing to score to an overwhelming 7-0. In a post-game interview, the Black Bears’ Head Coach Richard Reichenbach commented on the game strategy. “Our strategy was really to keep it very simple. The last few weeks we’ve been working on a lot of our systems and our team play,” Reichenbach said. Reichenbach also mentioned the importance of attention to detail at full speed. He was pleased with their progress and the footage they’ll get to look at to help guide improvements. He indicated there was a lot more to the team compared to last year and that there was less uncertainty with so many veteran players returning. “We’re really excited about this year. We have a lot of returning strengths and we’re excited to see the freshmen go to the ice,” Reichenbach said. He also praised the first-years for their confidence and poise. The biggest challenge of the game, according to Reichenbach, was not knowing what to expect from New Brunswick as a first-year team. He also remarked that they played well, in the second and third period especially, and that they were well coached. Black Bears goalie, second-year Loryn Porter, also gave post game comments. “It got pretty intense in the last little bit with the penalty kill, but I feel like we did a pretty good job in keeping stuff to the outside,” Porter said. The biggest source of pressure, according to Porter, was doing better after setting records last year. She remarked that UNB had a good offense and that UMaine first-years all played well. She hopes that the success of this first exhibition and the team chemistry continues for this exciting season of UMaine Women’s ice hockey. The official season opener is on Oct. 5 when the Black Bears take on the Quinnipiac Bobcats in Hamden, Connecticut.